It’s not just humans who turn to dogs for guidance, as one very adorable golden retriever and his helpful four-legged friend have proved. Owners Chelsea and Adam Stipe, from Mooresville, North Carolina, have had Charlie the 11-year-old retriever since he was just a fluffy little puppy. In 2016, the poor dog had to have his left eye removed as a result of glaucoma, which was causing him discomfort. A year later, his right eye was removed for the same reason. Speaking to NBC News, Chelsea said they didn’t hesitate to give Charlie everything they could. For us it was a no-brainer; empty our retirement plan to care for this dog because he makes us happy. 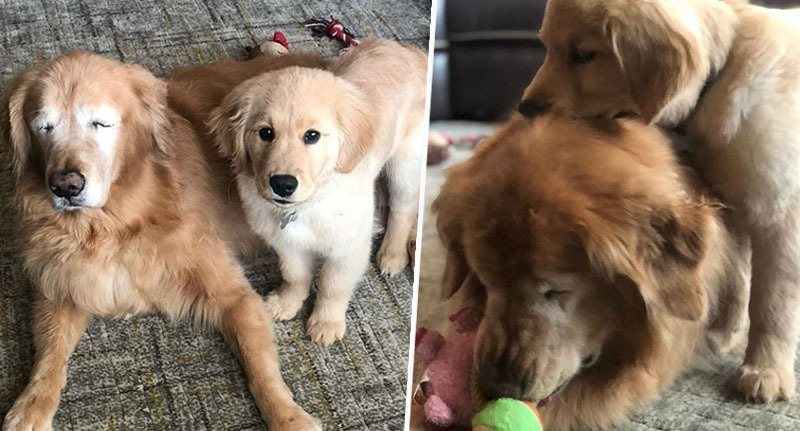 The owner explained how she’d always wanted to get another dog, and when she became pregnant she decided it would be the perfect opportunity to welcome a fur baby alongside her real child. That way, the baby could grow up with the puppy. On New Year’s Day 2019, the family welcomed the lively pup Maverick. Charlie wasn’t sure about the new addition at first, but the retriever eventually got used to his furry housemate. Chelsea explained how after a while, she noticed Maverick began to support Charlie and help him out when he struggled due to his blindness. They’re both pretty crazy and special. They’re definitely our entertainment. When they would play, Maverick would realize that Charlie would lose the toy sometimes, so [Maverick] would pick it up and put it back in front of him to re-engage playtime. They almost turn into little sled dogs where they’ll walk together. The owners knew their dogs were special, and so decided to submit their story to the social media account WeRateDogs, where the pets were awarded the high score they deserved. This is Charlie and Maverick. Charlie had his eyes removed due to glaucoma, but then Maverick came along as his little helper. Now they’re doing amazing. Both 14/10. The post quickly went viral with over 72,000 shares and 322,000 likes at the time of writing, and Chelsea has since set the lovely pair up with an Instagram account of their very own. ‘Charlieandmav’ reportedly gained more than 20,000 followers in the first day, and now has over 73,000. It was crazy, it was not what I was expecting. Everything has just been so positive and loving and I’ve even had people reaching out about their dogs who had glaucoma. Charlie and Maverick are certainly deserving of all their attention; they make the perfect team!